Tag line: "His camera takes 'em from love nests to Page One before they can bat an eye---or put on a negligee!" Here’s a nifty little pre-code gem for you: a 1933 comedy / drama starring James Cagney as a former mobster turned newspaper photographer who discovers his new career is as shady and dangerous as his old one. Gangland leader Danny Kean (Cagney) has just been released from Sing Sing, but instead of continuing his life of crime, he tells his cronies, including second-in-command jerry “The Mug” (Ralf Harolde) that he’s going legit. From there, he contacts newspaper editor J.R. McLean (Ralph Bellamy), who offered to give Danny a job once he got out of prison. Despite his lack of experience, Danny is hired to be a photographer for the Graphic News, a tabloid publication that specializes in gossip and controversy. It isn’t long before Danny becomes a valued member of the Graphic News team, and even though he has to occasionally dodge the advances of flirtatious co-worker Allison (Alice White), who happens to be McLean’s main squeeze, Danny is happy to finally put his criminal past behind him. Still, his job requires him to “stretch” the law from time to time, which puts him at odds with the cops, notably Lt. Casey Nolan (Robert Emmett O’Conner), the father of his steady girlfriend, journalism student Pat Nolan (Patricia Ellis). Can Danny win over Pat’s domineering father, or will the love of his life slip through his fingers? As directed by Lloyd Bacon, Picture Snatcher is a thrill-a-minute, a fast-paced motion picture that contains one pulse-pounding sequence after another. Danny’s first assignment for the Graphic News pits him against a heavily-armed fireman (G. Pat Collins) who, the night before, responded to a blaze in his own apartment, where he found the charred remains of his wife and her lover! Angry and embarrassed, this fireman has been taking potshots at every reporter who's come knocking. Thinking on his feet, Danny not only gets the picture, but sees it plastered all over the front page in the next day’s edition! Another sequence has Danny sneaking a camera in to a death row execution and taking an illegal snapshot of a female prisoner the moment she’s electrocuted (this was inspired by a real-life 1928 incident in Chicago, where a reporter, the camera tied to his ankle, photographed murderess Ruth Snyder while she was strapped to the chair). 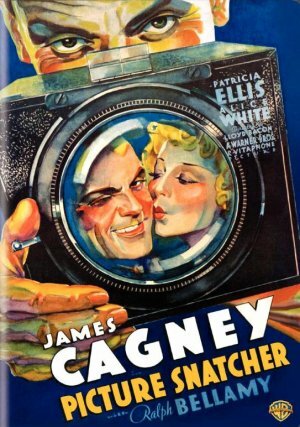 From there, Picture Snatcher features fistfights, car chases, shoot-outs, and, of course, James Cagney, who is himself a formidable force of nature in this film. The Public Enemy may have made James Cagney a star, but it was roles like Danny in Picture Snatcher that kept him on top, taking his tough-guy persona and peppering it with a splash of comedy. Rattling off dialogue at a rapid-fire pace, Cagney continually makes us laugh, whether he’s duping the cuckolded fireman (telling him he’s an insurance adjuster come to inspect the damages) or putting the frisky Allison in her place (like Mae Clarke before her, poor Alice White gets knocked around a little). Setting aside his nice guy image, Bellamy also shines as the alcoholic editor who takes a chance on Danny (a late scene where a drunken McLean walks in on Danny and Allison is a definite highlight). Throw in a few loose women (Alice White is especially alluring) and some not-too-subtle sexual innuendo, and you have a rollicking motion picture that thumbed its nose at the censors while also giving audiences of the day exactly what they wanted.